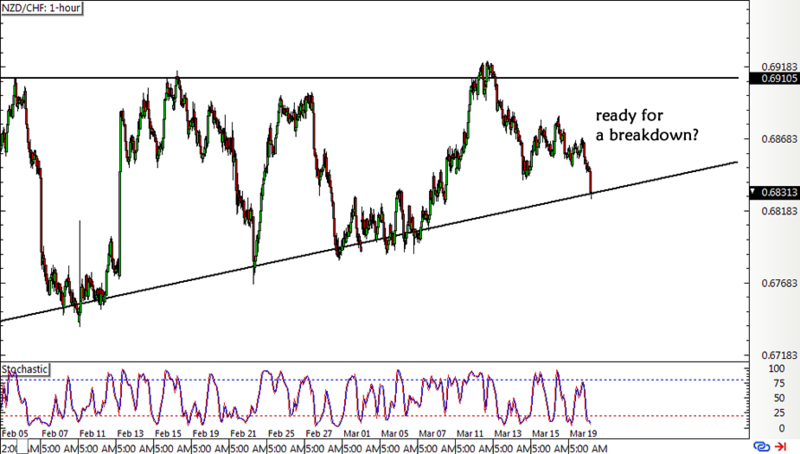 I’ve had my eye on the long-term NZD/CHF downtrend for quite some time, and I could get some entry confirmation on a shorter-term consolidation pattern. This pair has been hugging the top of its descending channel visible on the daily time frame, still deciding whether to make a bounce or a break. A strong upside breakout could signal that a reversal from the downtrend would follow, but a move below the current consolidation could confirm that the selloff is set to resume. 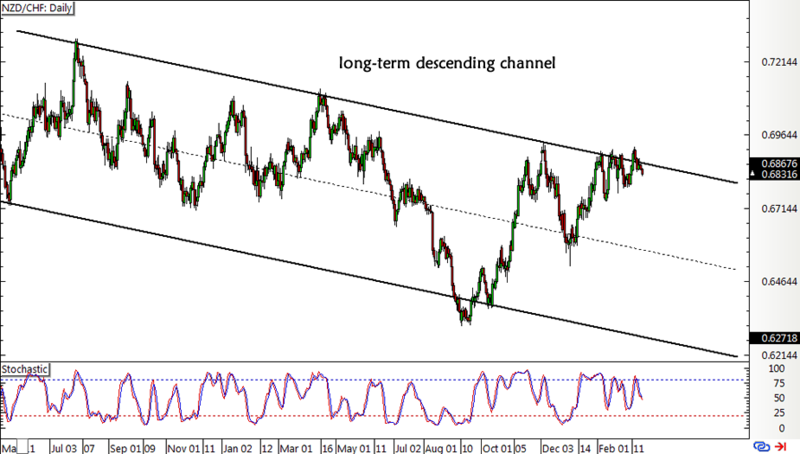 Stochastic is pointing down on this time frame to suggest that the odds are leaning in favor of sellers, possibly taking NZD/CHF to the bottom of the channel around .6200 or at least until the middle around .6500. Zooming in to the 1-hour chart shows this neat ascending triangle pattern that looks prime for a breakdown. I haven’t set entry orders yet since I don’t do so well with catching breakouts. Instead, I plan on waiting for an actual break lower then trying to hop in on a quick pullback. Besides, the SNB decision is still coming up so I don’t want to have any open franc positions during the actual event. Never know if Chairperson Jordan and his fellow policymakers might be up to something! If the announcement doesn’t really contain any big surprises, the lower-yielding franc might be able to hold on to its safe-haven appeal and benefit from risk-off flows. As for the Kiwi, New Zealand’s quarterly GDP report is up for release and analysts are expecting to see a 0.6% growth figure, twice as much as the earlier 0.3% expansion. A disappointing result, however, could force the currency to unwind its gains since it would remind traders that the RBNZ is a long way off from even considering hiking rates. My gut was telling me that this pair would make a downside triangle break last week, and break it did! I haven’t jumped in yet, but here’s what I plan to do.